What an incredible experience! Having the opportunity to not only present your artistic vision but to present a new concept in a venue like Naropa University is indescribably wonderful. This new art is like having two of my previously separate worlds unite to create a whole new universe. I am a little turned around by it and at the same time thrilled beyond all measure. A HUGE thanks to everyone who came to the reception! So many of my friends and colleagues are from far away places so I am posting a bit of a virtual show for you. This show is filled with new works on paper and on canvas, done in mixed media: acrylic / metal leaf and interference pigments. Interference pigments, in case you don’t know what those are, are dry pigments that come in different hues and you can use them dry or add them to paint / medium to create pearlescence, iridescence, and metallic / shimmer tones. I apply them to the surface of the painting to create texture and space as well as an interesting juxtaposition with the metal leaf. When creating paintings that are meant to express similar states as perfumes, or at least speak to the world of ‘essence’, I find the shimmering and the tactile as well as pure hues translate to the depth of emotion I am hoping to reach. The metallics really do something for me. (Maybe it’s all those years of doing egg tempera with gilding that I am still in love with color / metal). Not all the images have an olfactory sculpture (these are in the bottles hanging to the right of the paintings, so you can interact with the scent or not, depending on preferences) but these two that ‘open’ the show do. “Elemental Fire: Vermillion”‘s aroma is composed of DSH Fire Opal, DSH Poivre, Saffron, Black Pepper, Pimento Berry, and Amber and “Mercurial Nature”‘s aroma is: DSH Aroma color Viridian, Violet Leaf, Sandalwood, Green Oakmoss, Frankincense, and Ambergris. This group (above) doesn’t have a scent pairing. I really love these two together. “Aether” is a bit too elusive to conceive of an essence for it, although I may at some point consider it. 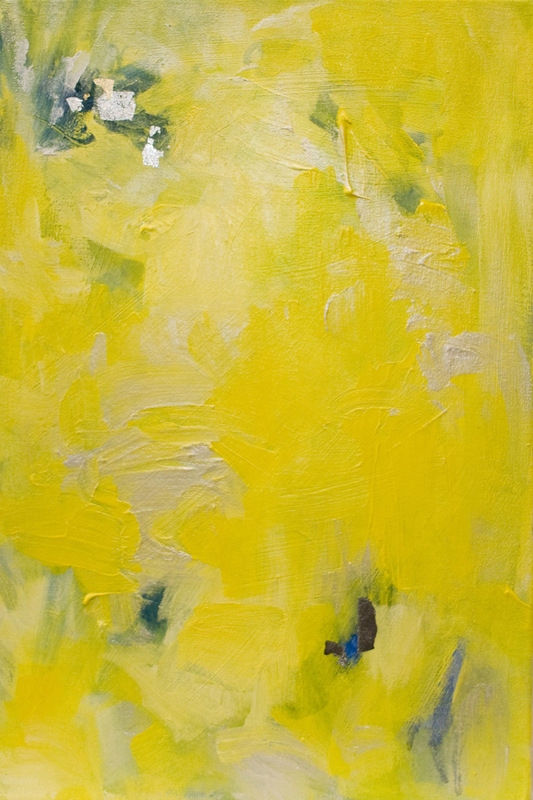 “Sunny Yellow” is actually a painting based on the scent. I strengthened the aroma for this show to make it a bit fuller: Yuzu, Petitgrain, Blood Orange, Neroli, Meyer Lemon, and Sandalwood. 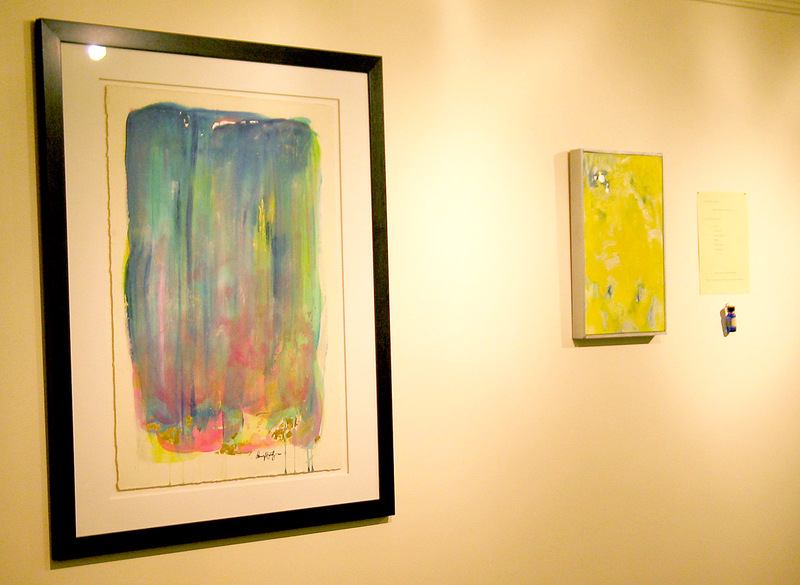 These paintings are much smaller and very intimate. I especially love the series 3 paintings. I still haven’t taken photos of these images directly, but I really love how the pigment application turned out. As you might imagine, handling dry pigment is a bit tricky and there is a sense of the unknown in terms of what will happen when you apply it. It’s one of those great process things that you can somewhat anticipate what will come out but you can never be too sure. The element of surprise is part of the joy. I will be sure to take more direct, detailed images of these and post them. 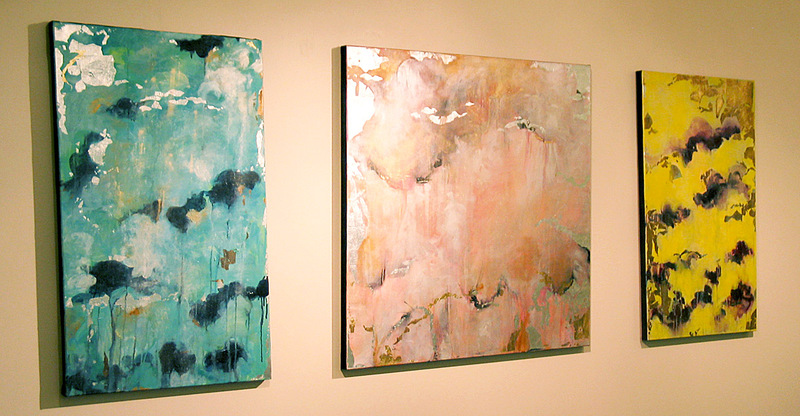 The “Butterflies (Transformation)” piece was very immediate when I painted it. The sense of action and transparency is something that also really attracts me. (You know, with abstraction I never really know what I am doing. It’s not at all like creating representational work where you know what things look like; you make decisions as the artist as to what you will record, what you will change, what you will omit or add and what it should all ‘do’ in the image. 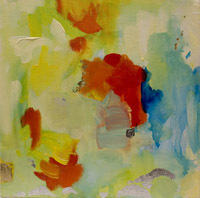 Abstraction for me is just about what I continue to want to look at; what compels me. It’s just so different.) Anyway, the scent sculpture is just as lovely and immediate for me with Red Mandarin, Green Tea, Grandiflorum Jasmine, Mango, Lemon, Sandalwood, Musk, and Lime Peel. I fear that this post is getting a little long so I will stop for now. There’s one more section of the show to come but we’ll explore this next time. For now, I hope that you enjoy the images and the descriptions. Oh yes, these aromas will be up on the site soon in a new collection…but that is for another day as well. I am wishing you a day filled with beauty. 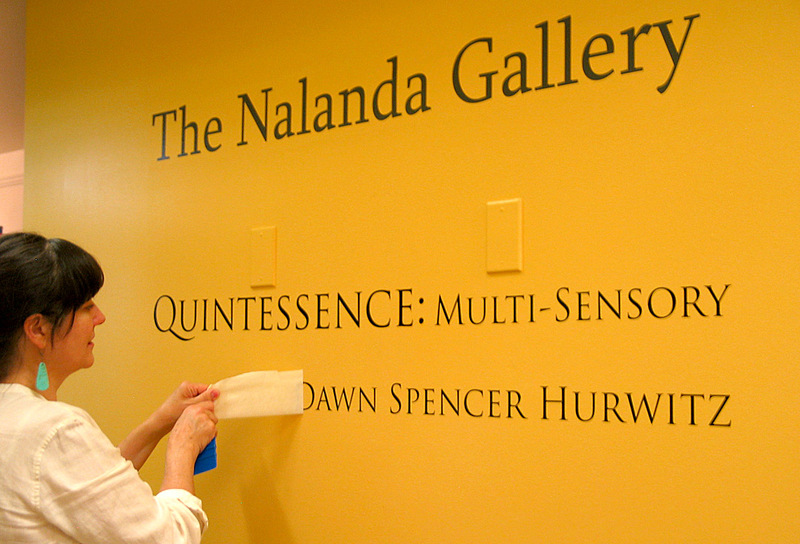 This mysterious project has been a dream of mine for longer than I can say and I am so very happy and proud to announce a solo exhibition of multi-sensory art work at the Nalanda Galleries at Naropa University. Some of you may know that my first love is painting and that I had a small solo show this January in Boulder, but to present this new and exciting art form at Naropa is truly amazing. 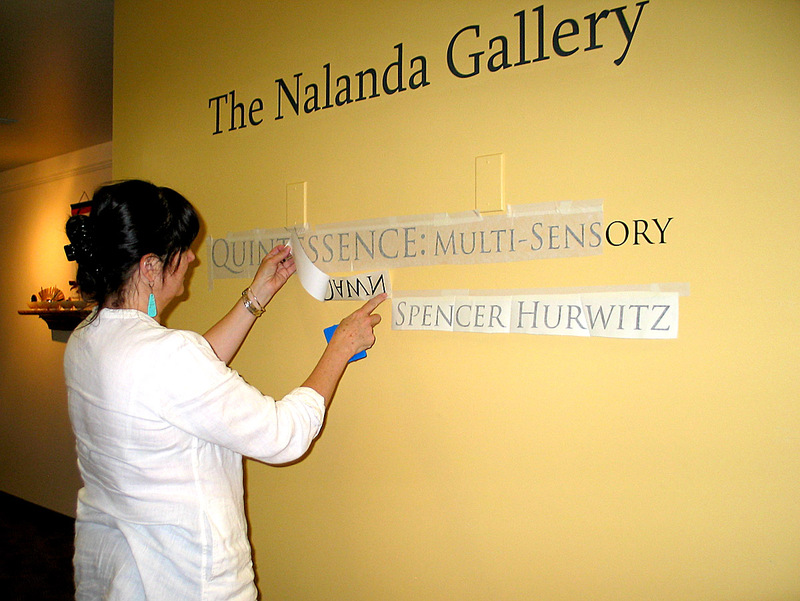 Now, what is multi-sensory art, you ask? I am presenting a group of new paintings as well as the aroma ‘sculptures’ that express the same textures, colors, structure and emotional impact as the images. It is art for the eyes and art for the nose that is relational to one another. I guess you could say that you can come smell the paintings…but it won’t smell like oil, turpentine or damar varnish. 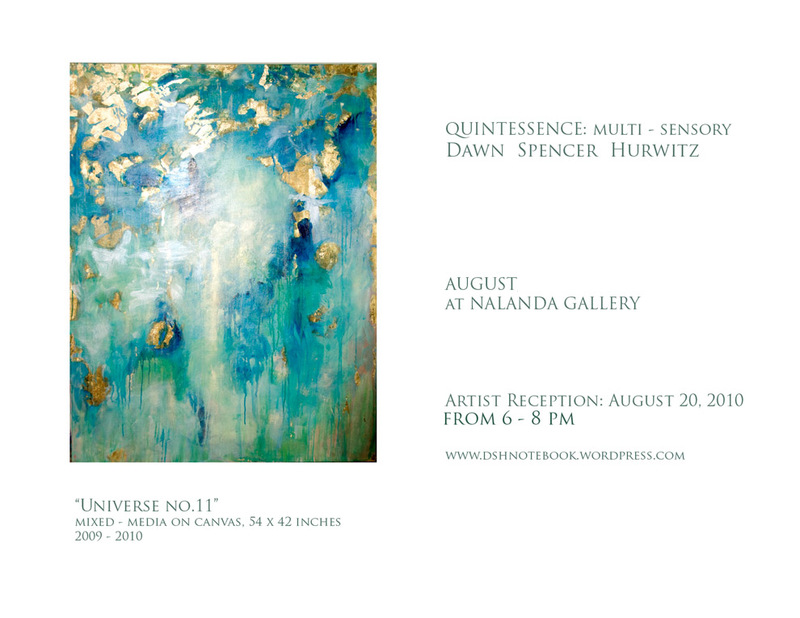 The show is called Quintessence: Multi-Sensory. I love the early alchemical referencing that comes along with perfume and how it is so closely aligns itself to the paintings and their esoteric feel.